Tangy and mildly spiced yellow pumpkin curry, specialty of Northern India, cuisine is from the states of Rajasthan and Uttar Pradesh. 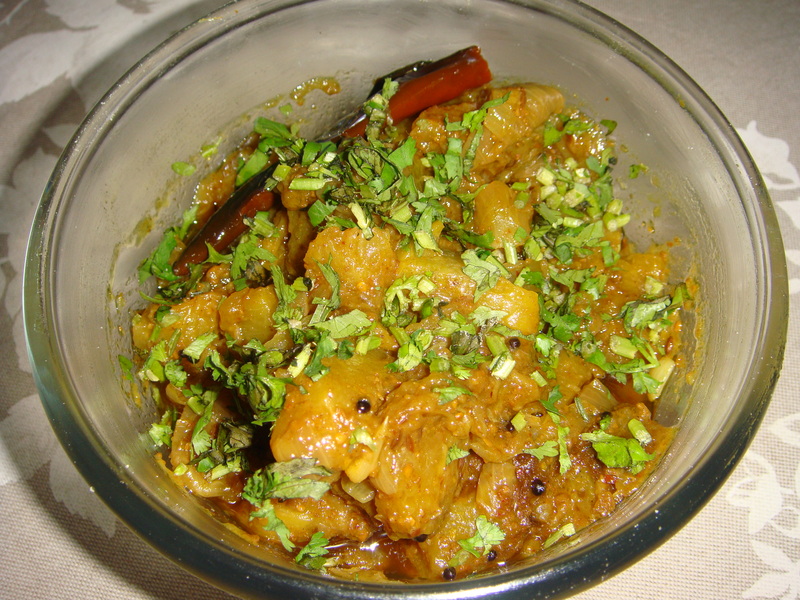 This sweet and sour pumpkin (kaddu) subzi is a specialty. Ripe yellow fleshed pumpkin is more suited for this subzi , the hard skin removed , yellow and green pumpkins can be used to make this delicious curry. This is usually served with puris. Wash, peel the hard skin and cut the pumpkin in big cubes, keep aside. Heat oil in a pressure cooker , add asafetida and as soon as the asafetida becomes pink in colour, add mustard seeds, cumin seed. When the mustard and cumin begins to crackle, add onions and fry until light golden in colour. Add all the other whole spices . Wait till the whole spices are fried for few seconds , add the pumpkin pieces salt and turmeric powder . Mix well and add 1/2 cup water and pressure cook, the moment full pressure is formed, switch off the heat. Let the cooker cool to room temperature. Then open the cooker and add sugar, aamchoor / dry mango powder and cover and cook for few minutes on low heat. Switch off the stove. Garnish with fresh coriander. Serve hot with crisp hot pooris or parathas. Note: Green skinned pumpkin can be used without peeling also, as skin is tender. Pumpkin is a storehouse of many anti-oxidant vitamins such as vitamin-A, vitamin-C and vitamin-E.With 7384 mg per 100 g, it is one of the vegetables in the Cucurbitaceae family featuring highest levels of vitamin-A, providing about 246% of RDA. Vitamin A is a powerful natural anti-oxidant and is required by the body for maintaining the integrity of skin and mucus membranes. It is also an essential vitamin for good visual sight. Research studies suggest that natural foods rich in vitamin A help a body protects against lung and oral cavity cancers.